Monocle offers limited edition BlackBerry 9700 | BlackBerry Blast! If you're a frequent traveler looking for a unique BlackBerry you might check out the limited edition BlackBerry 9700 by Monocle. In cooperation with RIM, Monocle has brought a limited edition BlackBerry to the market. The Monocle BlackBerry is pricey ($1500), but only 100 of them were made. The Monocle BlackBerry 9700 comes with a custom leather strap, limited edition detailing on the back, and Monocle's 25/25 travel guides pre-loaded. It also comes with custom wallpapers and a 16GB microSD card. 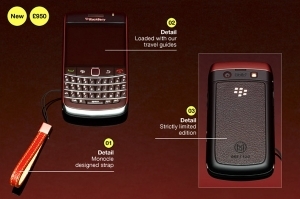 The Monocle BlackBerry 9700 will be available on December 10, 2009.